Don’t have a 3D printer? Neither does anyone else, seeing as it’s one of those new technologies that hasn’t made the leap to being a product the average person can afford. 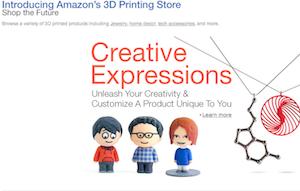 In the meantime, Amazon has decided to fill that gap by launching an online marketplace offering customizable 3D printed products. The marketplace opens today, Amazon says in a press release, with 200 products to choose from that are customizable by things like material, size, style and color, and some with options to add personalized text and image imprints. The products range from things like slim wallets and phone cases to toys, jewelry (including cufflinks for men), and home decor items. “The 3D Printed Products store allows us to help sellers, designers and manufacturers reach millions of customers while providing a fun and creative customer experience to personalize a potentially infinite number of products at great prices across many product categories,” says Petra Schindler-Carter, Director for Amazon Marketplace Sales. If you’re worried about how your 3D cufflinks will turn out, there’s a preview function that shows a virtual model of the product that rotates so you can see every side and angle before you order. Once the personalization process is done, each product is printed on-demand by the manufacturer and shipped. Thus far, it doesn’t seem that customers can upload their own designs and order up printable versions, but we wouldn’t be surprised if Amazon offers that in the future. Because who wouldn’t want to design a new take on something like, a cheesehead that holds real cheese? Or your own 3D version of Aaron Rodgers? Creepy, maybe, but awesome, definitely.